The ATSURAE custom order wetsuit is like a second skin. Utilizing the world’s best materials, a super composite skin(S.C.S), and a special design for triathlon swimming, the ATSURAE wetsuit will provide you with the ideal triathlon wetsuit. Measuring your body for a custom order wetsuit only takes 10 minutes. In addition, for each wetsuit body part, you can customize the thickness (from 1mm to 5mm) of the neoprene. If you need additional buoyancy or warmth, you can select a thickness of 5mm. If you have a strong kick or desire additional flexibility for your stroke, you can select a thickness of 1mm or 2mm. You only need to tell us how you swim and we can provide you with a vision of the ideal custom wetsuit. You can customize the thickness of the neoprene of each wetsuit body part. Our wetsuit is designed to fit your swimming style perfectly, not just your body size. Choose a logo from among the cool ATSURAE Japanese or English logos! You can also mix the logos in one wetsuit! For example - one ATSURAE Japanese logo on the front and one ATSURAE English logo on the arm. The ATSURAE innovative "BANZAI" design cutting allows easy arm movement and helps eliminate shoulder fatigue . The ATSURAE wetsuit is a two - piece design since 1999. This design makes the wetsuit not only light, but also easy to put on and take off. The ATSURAE wetsuit maximizes your performance potential. Do you fight against your own wetsuit rather than the competition? Because of its flexibility and comfort, the ATSURAE wetsuit allows you to easily make any type of movement (not just swimming specific movements) without restriction. During the swim, the last thing you need to do is waste extra-energy stretching the suit. Because of its unique design and superior construction, the ATSURAE wetsuit will efficiently maximize your performance. Around the neck, the S.C.S. skin is coated with a smooth material in order to prevent chafing while breathing. 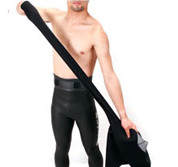 The ATSURAE wetsuit uses the highest quality S.C.S. skin and stretches more than any other wetsuit while still maintaining its original form. The ATSURAE wetsuit will provide you a stress-free wetsuit experience.